Join us, Thursday night as these eligible bachelors cross the auction block at SWAY Nightclub for our 8th annual Red Hot White Party! This is a Deliver the Dream Signature Event, raising critical funds for our mission. It is through the generosity of guests, attending our events, that we are able to provide healing retreats that enable families with serious illness or crisis, to build bonds and form relationships, to regain strength in mind, spirit, and family. Don’t miss out on the fun and excitement of bidding on exclusive date packages created by our bachelors, especially for you! Get your tickets today for an evening that you will never forget! Albert is a self-proclaimed extrovert, who embraces his love for NSync and the boyband era. He is looking for a special lady full of optimism, humor, and of course, mutual chemistry. Albert can’t live without his loved ones, music, or baseball, which explains his dream job of becoming a Major League Baseball Team President. He is a survivor, seriously ladies… Albert survived 39 days on Survivor! On a Saturday night, you can typically find him telling a joke, and buying a round for friends at a local bar. If Albert had to choose an actor to portray him in his life’s story, Will Smith would be called by his agent. 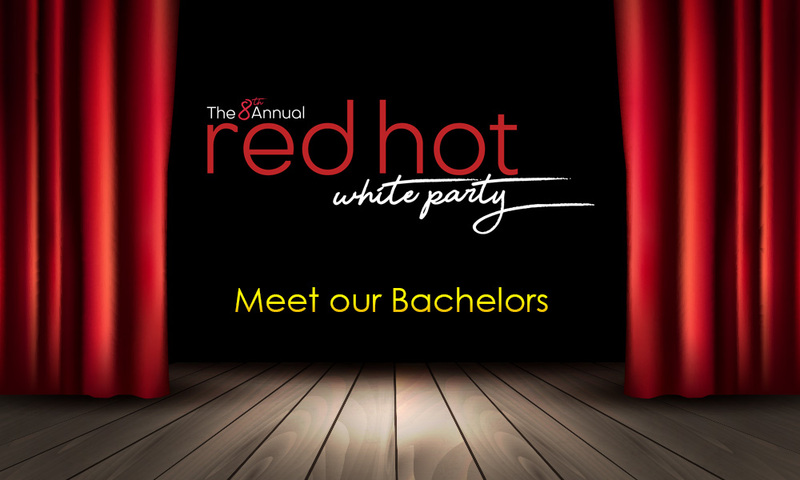 Attend the 8th annual Red Hot White Party for all of the exciting details! Chase can’t live his best life without his family, friends, and the ocean. His first job was at a seafood market, where he would daydream all day about becoming the Captain of a yacht. These days he prefers to BBQ brisket and cooks other southern foods at home, however, he will never turn down Oreos and Ice Cream at midnight. Chase is looking for someone who is charismatic, funny, and outgoing to share life with. In his free time, Chase likes to explore the Breckenridge, Colorado area and jam out to Single Ladies by Beyoncé. Craig is a renaissance man looking for a special lady who lives a healthy lifestyle, loves to laugh, and has hobbies to enjoy. 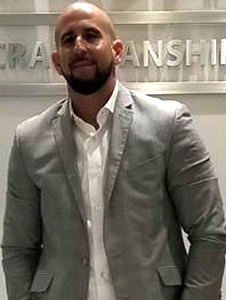 When he is not at the gym, hitting the links, or playing guitar, Craig can be found spending time out on the beautiful beaches of South Florida. His favorite place to vacation is in Italy and it is not only because of the amazing culinary experience that inspires him to cook lobster mac and cheese from scratch when he is at home but the amazing people he meets every time he visits. Craig’s first job while growing up was as a bagboy at Winn Dixie and to this day, he still daydreams about becoming an astronaut and touching the stars. If given the choice of actors to portray him in a movie about his life story, Craig would call on Wolverine himself, Hugh Jackman. Eric considers himself a modern romantic and is looking for his equal match in someone outgoing, family-focused, and passionate about life. His biggest accomplishment is creating a thriving business that’s sole purpose is to provide comfort and peace of mind for the aging and their families. 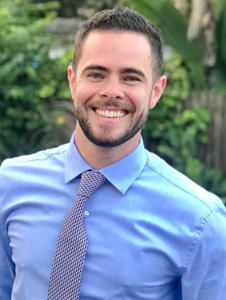 Apart from excelling in his career, Eric has a secret talent of cooking up a storm in the kitchen with the containers of leftovers from his fridge and loves spending time along the white sand beaches of South Florida. Eric and Craig’s date package includes a luxurious two-night stay in the Penthouse at the GALLERYone, a Doubletree Suites by Hilton in Fort Lauderdale, Florida. Visit the VUE pool bar on the Intracoastal Waterway for cocktails, or visit VUE on the Water restaurant for Chef Angelo’s freshly prepared culinary creations. Fort Lauderdale’s Galleria mall is right next door where you can enjoy premiere shopping. And that’s not all! Board the Water Taxi, right at GALLERYone and travel by water to many of Fort Lauderdale’s “hot spots”, including Las Olas Boulevard, a must-see for all travelers and locals alike. Some restrictions do apply for this spectacular package. Bookings must be made for June or July and are good for Friday and Saturday night stays only. Parking and room service are not included and the reservation must be made one month in advance due to the popularity of the Penthouse experience. Captain America would portray this man in his life’s story. Gustavo is selfless, passionate and unique. He loves music and his first job was as a music teacher specializing in saxophone tutoring. Gustavo can’t live without God, his family and friends, and coffee. He is looking for a kindhearted, ambitious woman, willing to put in the effort because he loves making his partner feel special and believes it should go both ways. Gustavo learned to cook from his Grandma and his prized possession is her secret Chupe de Pollo soup recipe. His dream job is becoming the CEO of an entertainment or sports venue. 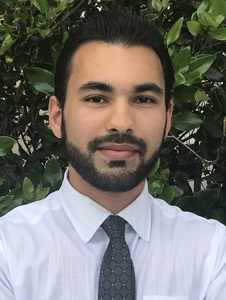 In his spare time, Gustavo loves tailgating with friends and attending Miami Hurricanes football games, but on a Saturday night, you will find him with a good scotch in hand getting ready to go dancing. 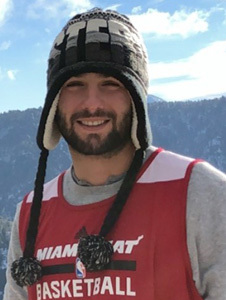 Jonathan grew up along the white sand beaches of South Florida enjoying the ocean and his first job at BC Surf and Sport. He is a fun-loving guy, looking for an openminded, adventurous, and spontaneous girl. His favorite spot to vacation is in San Diego, California and he is a very proud uncle to his beautiful nieces and nephews. Jonathan dreams of becoming a professional DJ, but in his spare time, he loves to volunteer at Second Harvest Food Bank. On a Saturday night, you will most likely find him at El Camino or eating Peanut Butter M&Ms. Ladies, this man can’t live without music, tacos, or puppies! One of the best ways to explore the city of Fort Lauderdale is from the water and Jonathan couldn’t agree more. Enjoy full day passes on Fort Lauderdale Water Taxi, where the captains and crew are well versed on the city and all of the attractions that can be viewed from the water. After your excursion and discovering the 10 different Fort Lauderdale Water Taxi stops, take the taxi to 15th Street Fisheries & Dockside Café for the freshest seafood and absolute best waterfront dining experience in the city. Located inside the city’s most famous nautical landmark, Lauderdale Marina, the restaurant boasts one of the area’s top attractions, feeding giant tarpon fish from the marina’s docks. Winner of numerous awards, year after year, the Fisheries is one of the most outstanding restaurants in South Florida with the best panoramic water views Fort Lauderdale has to offer. 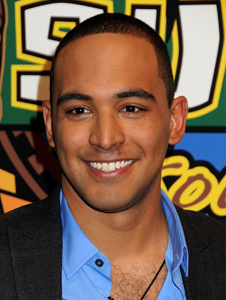 Morgan loves to stay active and can’t live without the gym, golf, or snowboarding in his free time. He is looking for someone who is down to earth, loves to laugh, and is athletic to share in his Best Life. When asked, his friends describe him as sarcastic, outgoing, and carefree. Morgan dreams of becoming a professional golfer and traveling the world, but finds that South Florida is the perfect place to live and play! He loves to get away for a quick vacation and enjoys anywhere that has fresh powder for snowboarding and hitting the slopes. If the chance came up to have a famous Hollywood actor portray him in his life’s story, Morgan would have his people call Owen Wilson’s people. Join Morgan for the most fun you’ll have in Delray Beach at Putt’NAround Mini Golf & Sports Bar. It is lady’s choice, play 18 holes on the tropical Ocean course or 18 on the native Florida-themed Everglades. After the fun is over, cool off in the air-conditioned clubhouse for some relaxation and refreshments, before immersing yourself in an unforgettable entertainment experience at IPIC Theaters. With artisanal dishes from Chef Sherry Yard and handcrafted cocktails from Master Mixologists, enjoy dinner and drinks in the dark theater while you watch the latest release from Premium Plus seats with exceptional full-service, for a truly elevated sensory experience. 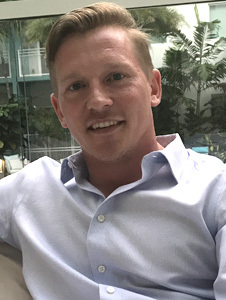 Scott is an entrepreneur, who feels accomplished in his work with his partners, starting Rb Solar Pro and growing it to a multimillion-dollar business in less than 3 years! He is looking for a special someone full of confidence, passion, and honesty to help him take over the world. His favorite midnight snack is cheesecake and he absolutely loves to cook everything from scratch. Scott can’t live without his family, friends, and happiness in his daily life. His first job was as a camp counselor which fostered his love to volunteer, helping underprivileged kids at his partner’s charity, Always Progress. When not enjoying the weather in South Florida, Scott enjoys traveling around the country playing competitive adult kickball! However, on a typical Saturday, you can find him laying by the pool or relaxing on the beach! Get ready to learn the fundamentals of tennis! Scott’s date package includes a professional tennis lesson. After working up a sweat on the courts of Miami, enjoy the sweeping views and Biscayne Bay at Conrad Miami’s LVL 25. Level 25 is the setting for Miami’s only 25th-floor restaurant and lounge, serving globally inspired cuisine amidst modern, minimalist decor. Gaze out over the lights of Miami’s evening skyline together, as you enjoy a creative signature meal and a bespoke cocktail.